1.When you display the artificial Flower for a long time,there may be some dust on it,you can use hairdryer's cold air clean it. 2.If there is too much dust or the artificial flower is polluted badly,you can also clean it by wet dishcloth.Or you can dig them in brine 2 hours,then use clean water wash it.Don't Scrub it,or the flower head will be broken. 4.It may be Squeezed in the transit,Slightly arrange flowers,it will show as you excepted. 5.Some pics look like larger size, please compare the detail sizes of exact item, please allow 1-2cm difference due to manual measurement. 6.The colors might be sightly different as the difference display,thank you for your understanding. 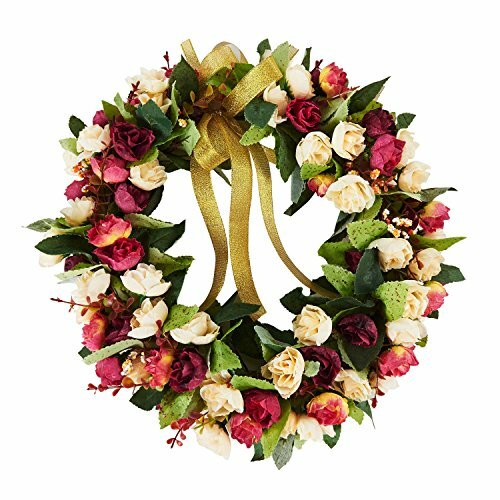 Material: Senior silk cloth, handmade quality artifical wreath. Wreath outer diameter: approx. 14inches/35cm, perfect for home room door and window. Best gift for your loved ones on Christmas valentine's day Thanksgiving Mother's Day Father's Day etc. Occasion: Window, front door, kitchen, living room, bed room, party, holiday, christmas activity, etc. If you have any questions about this product by Baigio Woman, contact us by completing and submitting the form below. If you are looking for a specif part number, please include it with your message.